Center on Gunflint Lake on Thursday, August 27th, at 3:30. For more information call 388-2273. A five-person crew from the Minnesota Conservation Corp (MCC) spent eight tough days widening the remote interior of the Banadad Ski Trail. The crew hiked in from the west end trailhead, setting up camp at the bench midway to the Bedew Lake Yurt Camp. After several days clearing the trail on either side of their camp, the crew then moved onto Bedew where the sent several more days widening the trail from the yurts to the midtrail junction. When they finally hike out from Bedew the crew had widen two full miles and cleared many down trees blocking the eight miles of the trail they covered. It is speculated that the down trees were the result of a nasty hail-wind storm cell that hit the western end of the Banadad on August 13. Luckily it appears the storm missed the trail’s eastern end. Now with this year’s work by MCC some eight remote interior miles of the Banadad have been widen over the last four years. Yet to be widened is about one and one-half more miles some of which it is anticipated will be taken-on this fall. 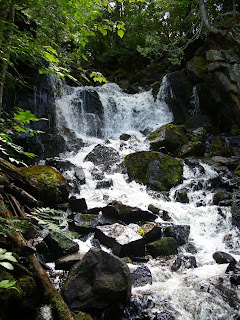 Looking for an adventurous hike along the Gunflint? You might want to consider going into Bridal Falls. Recently guests from Taunton, Minnesota, and staying at the Little Ollie Cabin took on the challenge. is located on the far south eastern end of Gunflint Lake. It is long hike in along the Border Route Trail. Plan a full day if you want to take in this adventure. Locate just to the east of the falls is the remains of the old "cord-wood" railroad trestle . First used by the Pigeon River Lumber Company as part of a railroad side spur called the Gunflint & Lake Superior Railroad from Little Gunflint Lake, 3 and ½ miles to Crab Lake in 1903. For several years this logging venture succeeded in shipping a rich harvest of timber from the Crab Lake area onto the mills in Port Arthur. In more recent times the trestle became part of the snowmobile route between Loon and Gunflint Lake. The trestle began burning in the recent Ham Lake Fire and is still smolders. Remains of the trestle are still visable. guides to wild and edible plants that can help. slow their spread, check out the "Non-Native Invasive Species" section.